That depends. Orange Beach weddings held at any public beach access points (such as Alabama Point, Cotton Bayou Beach Access, etc), you will need to contact the Gulf State Park for a permit; call 251-948-7275 between the hours of 8am & 4pm, Monday through Friday. For more information about planning your Beach Wedding, visit orangebeach.com. How do I report dead animals? If the animal is impeding traffic or is in the right-of-way, immedately call Orange Beach Police Department at 251-981-9777. Depending on the circumstance related to the animal, the Dispatcher will route the call to the appropriate department. What do I do if a light is out on my street? On every street light, there should be a yellow tag with black numbers. Call 251-974-1023 and report the street light out, using this number. You can also email smiller@orangebeachal.gov. Call 251-974-1023. Please leave a message if after hours or email smiller@orangebeachal.gov. There is a street sign down, what should I do? Vendors may register to be notified of bids through Vendor Registry. Can I Cook With A Grill On My Balcony? No. Gas-fired grills shall not be used on any balcony or under any overhanging portion or within 10 feet of any structure. Can I Burn Debris On My Property? Can I Have A Fire Pit On The Beach? Any open fires or use of flammable items, including but not limited to charcoal or gas grills, torches, (e.g., Tiki torches, etc.) and/or fireworks per are considered inappropriate and unlawful per Ordinance 2005-946. How Do I Become A Part of the Orange Beach Fire Department Or Surf Rescue? All job postings are listed in accordance with the City of Orange Beach Human Resource Department. Can balloons be released during an event in Orange Beach? The City of Orange Beach does not have an ordinance that would prohibit the release of helium balloons on the beach. However the balloons are prohibited from containing fire or combustible material (such as candles, lights, lighters, etc.). Please remember, based on past complaints, that the balloons may eventually end up as debris on someone else’s property. Can I use the same application to apply for several positions? A resume CANNOT take the place of a completed application. However, the Human Resources Department will accept resumes if they are part of an application packet. You may fax your application to (251)981-1442. The fax MUST be received before 5:00 p.m. Orange Beach, AL time on the closing date. Can I submit an Employment Application even though there is no opening? No. We only accept Employment Applications for specified positions at which time that position is advertised. There are many factors which can affect how long it takes to fill a position with the City of Orange Beach, for example: background check, the hiring department's schedule, drug screening, or etc. However, it can take from 2 to 3 weeks after the closing date to fill a position. Where does the City of Orange Beach announce its job vacancies? The City of Orange Beach posts job vacancy announcements on its website at www.orangebeachal.gov/jobs. The City also posts job vacancy announcements at City Hall located at 4099 Orange Beach Boulevard, Orange Beach, AL 36561. Periodically, the City may advertise some job vacancies in the local newspaper, magazines, specialized journals and newsletters. What does the 5:00 p.m. closing date mean? What if I apply for a position after the 5:00 p.m. closing date? What if the closing date is "open until filled? The 5:00 p.m. closing date means this is the last date and time an application will be accepted for that position. The closing date is indicated on the Job Announcement. The application can be delivered in person, on-line, by hand-mail, by the U.S. postal service or any other mail delivery service, or by facsimile (251) 981-1442. If an application is received by any of these methods after 5:00 p.m., the application will not be reviewed and will be returned to the applicant. A position which states "position will remain open until filled" indicates applications are continuously evaluated until further notice. The announcement may be closed at any time without prior notice. Animal Control Officers are authorized to investigate canine and wildlife related complaints. Patrol officers are able to issue citations for animal ordinance violations. Please contact the Orange Beach Police Department at (251) 981-9777. I have some old, outdated prescription medications at my house. Where can I safely dispose of them? Old prescriptions can be dangerous and should not be disposed of improperly. 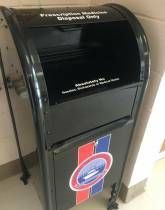 The Orange Beach Police Department has made a disposal site available, free-of-charge. You will find the drop box just inside the lobby of the Police Department. There is no fee and the box is available 24 hours a day/seven days a week. You may leave these drugs in their original container, or seal them in a bag or other non-breakable container for disposal. No information is gathered from the containers. How do I setup visitation with an inmate? Visitation is on Wednesday from 1:30 pm to 4:00 pm, and on Sunday from 4:00 pm to 7:30 pm. Visitors will need to bring a picture ID. Children will be admitted with an adult only. We have a limited visiting area so please try to be flexible. To reduce your wait time, please call 251-981-9777. If you have a special need or handicap, please call in advance so we can make arrangements for you. A report can be obtained by contacting the Administration office at 251-981-9777 or by coming to the Orange Beach Police Department located at 4480 Orange Beach Blvd. Orange Beach, AL 36561. There is a $5.00 charge for all copies of reports. Please have any pertinent information (such as case numbers, dates, locations and or names of person(s) involved) to insure prompt and accurate service. The Orange Beach Police Department provides fingerprinting services for a variety of reasons, including teaching credentials, adoptions, employment, sales, real estate, etc. We do not provide fingerprint services for immigration purposes; call the Orange Beach Police Department to make an appointment at (251) 981-9777. First and foremost, don't confront the subject(s) and STAY SAFE!! Are there any physical characteristics such as height, weight, race, beard, scars or tattoos? Can you give any clothing descriptions? Are the persons involved on foot or in a vehicle, if in a vehicle, what make, model, color? The Orange Beach Police Department NEVER solicits money over the phone. If you get a call claiming to raise money for the Orange Beach Police Department, report the call to the Orange Beach Police Department. Yes, we ship anything that fits in a large flat rate box. For larger works, please visit local shipping specialists. Yes, we can also mail them. Can you give an estimated value on art work I own? No, we do not give art valuations. Is there a cost to get in your gallery? No, admission is free to all three buildings on our campus. Are all your items for sale? Yes, we have glass, pottery, fine art, jewelry and more for sale. Yes, they are primarily local and from the Gulf Coast region. We rotate artwork approximately every 3 months. Can I paint already finished pieces of pottery? Yes. We offer Pick-n-Paint for $20 and up, per item. Call for a reservation. When is the Clay Studio open? Can I book The Clay Studio for a private event? Yes. The Clay Studio is available to rent for birthday parties and special occasions for $85 per hour. If you wish to paint pottery, a per item/per person fee is also applied. How long does a piece of pottery take to complete? If you paint an already finished piece, you may retrieve your item within 24 to 48 hours. If you sculpt your own piece, it will take between 1-3 days to dry, then it takes 1-2 days to fire it in the kiln; you can return to glaze your piece at this point. It is then fired in the kiln for a second time (which also takes 1-2 days). You may pick up the finished product after approximately 7-10 business days from your start date. Can I learn to make my own pottery? Yes. Our resident Ceramics Artist offers instruction in clay hand building, wheel throwing and painting. Sessions are an hour long and you will learn several techniques. Call for more details or email bthomley@orangebeachal.gov or adimario@orangebeachal.gov. Should I bring anything to my class? Closed-toe shoes are required. 100% Cotton clothing is preferred, and any synthetic materials are not recommended. You are welcome to bring your own sunglasses for eye protection, but safety glasses are provided. Feel free to bring a drink since classes can last up to 2.5 hours. Can we take pictures in the Hot Shop? Of course! We encourage pictures and always appreciate when you tag us in your photos on Facebook or Instagram. Can I make a jellyfish, turtle, or any other glass item sold in the gallery? All of the pieces we have in our shop have taken the glassblowers years to learn how to make, so they are not something we can offer for the Make Your Own class. The object of the class is to *experience* glassblowing with lots of help from a highly skilled glassblower (because it is not something that can easily be done in the first few attempts- it takes years to build the skills required to pull off even the simplest pieces.) Therefore, no one should try to replicate an exact piece or design as all glass items turn out uniquely different even for an experienced glassblower- which is part of the beauty of this art form. Can I design my own piece or bring something in to incorporate into my paperweight, flower, or ornament? No. We cannot incorporate any other material into the glass because it will cool at a different rate which will cause stress cracks and/or breakage. Appointments are set for 9 a.m. Mon.-Fri. and we ask that you arrive 5-10 minutes early for your appointment. Can I be successful at a Make Your Own class if I have no knowledge or experience? Yes. It is a basic, introductory class and, before you begin, a detailed description of the process will be explained, as well as demonstrations of each item you will be able to choose from. It is recommended that you research glassblowing (i.e. youtube videos) to gain a basic understanding of glassblowing so the process will not be as foreign the day of your class. For Make Your Own classes or hourly rental we ask for 48 hour notice for reschedule or cancellation. All appointments are held with a credit card. For no shows or day-of cancellations, we will charge your credit card for the total class amount. What will I have to specifically do in the Make Your Own class? The paperweight, globe and flower each have a different process which is why we demonstrate each piece first to show you what you will be doing. You will choose your colors and assist the instructor according to your capabilities (i.e. using tools to sculpt, blowing air into the blow pipe, taking heats, etc.) You may take a more active or passive role based on your physical ability or comfort level. Can children take the Make Your Own class? We require that children be at least 8 years of age because it takes extreme focus & understanding of multiple concepts. Parking is at the Wharf west lot and at Orange Beach City Hall complex with shuttle service offered by BRATS for an all day pass at $5. Parking for guests approaching from east Orange Beach (Bear Point, Caswell, etc.) is located at the Orange Beach Presbyterian Church. Handicapped Parking is available at the First Baptist Church, next to the festival grounds at 4773 Bay Circle, Orange Beach, AL 36561. No this is a free event. Is the show always at the same time of year? Yes, it is always the second full weekend of March. We always host our show one week prior to the Fairhope Arts and Crafts show. What kind of artwork will I see? We offer a tremendous variety of mediums with an average of 95 artists, including oils, acrylics, pottery, wood, glass, jewelry, mix-media, pencil, metal, photography, graphic, etc. Can anyone rent a booth at this show? No, this is a juried fine arts show only, with culinary and musical artists by invitation. If I am an artist and want to apply, what are the deadlines? Applications are accepted through www.ZAPPLICATION.org. The application process opens August 1 of each year, and closes on October 31. Notification of accepted/waitlist/declined artists is announced through Zapplication after our juror process. The deadline to then pay your booth fee(s) are mid January of each festival year. Double booths are limited and first come/first served basis. When is recycling picked up in Orange Beach? RECYCLE PICKUP IS DIVIDED INTO 2 ZONES. EACH ZONE RECEIVES PICKUP EVERY OTHER WEEK ON WEDNESDAY. When referring to the Zone Map, Zone 1 = Gray and Zone 2 = Blue. What can and cannot be recycled in Orange Beach? Styrofoam cups, containers, coolers, packing materials, etc. Do I contact your office for property tax issues? Property taxes are handled by the Baldwin County Revenue Commissioner. You can get information from their web site www.revcomm.co.baldwin.al.us or call the Foley Satellite Courthouse at 251 943-5061. Does the City provide the water utility? No. 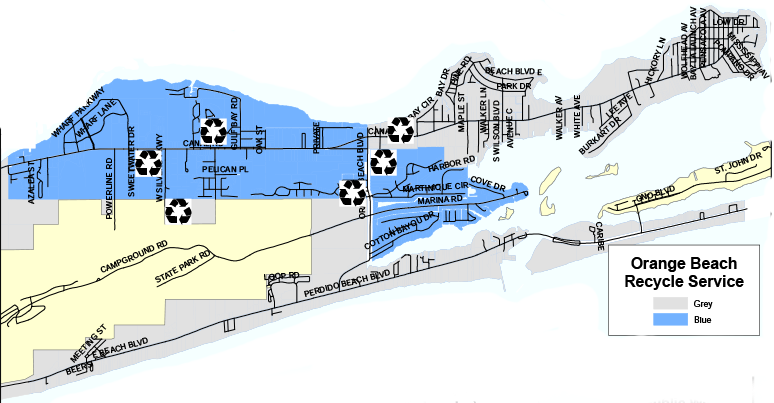 Water service for the City is provided by the Orange Beach Water Authority located at 25097 Canal Road. They can be reached at 251-981-4233.
Who do I call if I have a garbage problem such as a missed pickup or damaged can? You should call our main number 251-981-6096. When is household garbage picked up? Every Tuesday and Friday. The can with the blue lid must be placed with the opening facing the road and 3 feet away from any obstacle. The contents of the can cannot exceed 90 pounds. Yes, it is located in the third drive through lane in the back of the building. Decals are on a three-year cycle. Ono Island and Condo owners obtain their passes from their POA. All others can be picked up in the Finance Department office located at 4151 Orange Beach Blvd, M-F 8:00 to 5:00. Decals will not be issued once a named storm has entered the Gulf. You do not have to affix them to your vehicle until needed. There is a charge for replacement decals. Can I pay on-line or over the phone? While we do not currently accept Business Licenses or Sewer/Garbage payments online we do accept Credit Card payments over the phone with a 2.95% convenience fee. To pay Taxes on-line, go to myalabamataxes.alabama.gov. When do I have to renew my business license? The license expires December 31 of each year, however, it does not have to be renewed during December. Renewal notices are mailed early to mid December and you have until January 31 to renew without penalty. Can I have my sewer and garbage service charges drafted from my account? Yes, we can draft monthly service charges from your bank account (savings or checking). Please complete the Authorization for Pre-authorized Payment form. Do I need a business license to rent my condo or house even if a management company handles the rental for me? Yes, the license is the responsibility of the owner not the management company. When and where do I get business hurricane decals? Business decals are issued annually by our office beginning in April. Do I have to have a business license prior to submitting a bid? No. You do not have to have a license to get on the bid list, or to bid; however, you will need to complete the business license process before a purchase order can be written. Contact the Revenue Department at 251-981-6096 for more complete information on licensing. Where do I send a bid package? Prospective vendors may sign up to be notified of bid postings through Vendor Registry. The following are not required before being placed on the Bid List nor are they required to submit a bid, but the following forms will be required prior to the City of Orange Beach issuing a purchase order to a vendor: Current year signed and dated W-9, an affidavit that the business complies with the current Beason-Hammon Alabama Taxpayer and Citizen Protection Act in hiring of immigrants and a copy of current City of Orange Beach Business License. Is a bid bond required? The State of Alabama bid law states that if the bid amount is $10,000.00 or more, a bid bond may be required. If a Bid Bond is required, the bid should be accompanied by a cashier’s check, certified check, bank draft or bid bond for the sum of 5% of the amount of the bid but not to exceed $10,000, made payable to the City of Orange Beach. All checks will be returned promptly, except the check of the successful bidder, which shall be returned after fulfilling the bid. What are the Community Development hours of operation? The Community Development Department is open from 7:00 a.m. to 5:00 p.m., Monday through Friday. What are the zoning requirements for fences? The maximum height for fences on residential properties is six feet. Fences located within the front yard setback (30 feet from front property line), must be less than or equal to four feet in height. Fences shall be installed with the finished side facing the adjoining property or public or private right-of-way. Fence posts must be located on the inside of the fence facing the property on which the fence is located. Posts and supporting members may be viewable if the fence has a shadowbox design or uses panels across the front and back to give the fence a finished appearance on both sides. There are no setback requirements for fences, and a permit is not required. Do I need a permit to repair my home or business following a storm? Following a disaster, the City must provide damage estimates to the Federal Government in order to be eligible for Federal grant money. Acquiring a permit for all repair work assists the City in demonstrating eligibility for Federal assistance. DO NOT begin permanent repairs following a declared disaster until your property damage has been assessed and recorded by the City and a repair permit has been issued. Permits are generally required for all new work and work proposed for existing structures and systems other than maintenance. The best way to determine if a permit is required is to call the Building Department at (251) 981-2610 BEFORE you begin the work. Are duplexes allowed in residentially-zoned areas? Duplexes are not allowed in the RS-2 or RS-3 zoning districts. Duplexes are allowed in RS-1 if granted a conditional use approval by City Council. In order to be eligible for a conditional use approval, the RS-1 lots must meet the following conditions: (1) have a lot area equal to or exceeding 10,500 square feet; (2) have a lot width equal to or exceeding 75 feet; and (3) be located on either a navigable waterway or residential arterial/collector street. If you are the owner of the property and do not intend to sell the home within one year, you may claim exemption from the licensing requirements of the Alabama Home Builders Licehsure Board and are eligible to obtain an owner-builder permit. Subcontractors are still subject to local and State licensing requirements. Any contractor performing home building construction of any kind, who contracts for more than $10,000, is required to be licensed by the Alabama Home Builders Licensure Board. What type of fill is permitted to use at my construction site? White beach quality sand is accepted in all areas of the city as long as a permit is acquired prior to placement. However, the placement of clay and dark colored fill is restricted in certain areas. Prior to the placement of fill, a stormwater permit must be acquired from the Community Development Department. The stormwater permit application submittal needs to include a sample of the proposed fill material to determine whether it is allowable in the proposed location. Are permits required for boat slips, boat houses, and bulkheads? A city marine accessory permit is required for new or reconstructed boat slips, boat houses, boat docks and bulkheads. Prior to issuance of a city marine accessory permit, the applicant must provide document ensuring approval from the U.S. Army Corps of Engineers and the Alabama Department of Conservation & Natural Resources State Lands Division. Do I need a permit to cut/prune a tree on my property? The city has a tree protection ordinance that restricts the removal of certain sizes and types of trees. Prior to removing or pruning a tree, please contact the Community Development Department to verify whether the proposed work requires a tree removal permit, (251)981-2610. Is my lot located within a FEMA designated Special Flood Hazard Zone? You can verify whether your property is located within a flood zone by clicking here to access the interactive flood map or by clicking here to access the city's GIS map. The Community Development Department has current and archived Flood Insurance Rate Maps on file. Staff is available to assist you in determining whether your property is located in a flood zone, provide determination letters and to answer questions. When building a home located within an “AE” flood zone, the finished floor of the home must be elevated a minimum of 2 feet above the Base Flood Elevation. When building in a “VE” flood zone, the lowest horizontal structural member of a new home must be a minimum of 3 feet above the Base Flood Elevation. The Community Development Department maintains Elevation Certificates for homes constructed within a Special Flood Hazard Area. In order to determine whether there are wetlands located on your property, please contact the U.S. Army Corps of Engineers at (251)690-2658 or the Alabama Department of Environmental Management at (251)304-1176. Are there insurance discounts available for new construction? The State of Alabama mandates insurance discounts for homes that have been issued a “Fortified Designation” as provided by the Fortified Home™ Program. Compliance with Orange Beach construction standards will qualify a home for a “Gold Fortified Designation’, but ONLY if the home is verified by approved 3rd party inspections. Roof replacement in Orange Beach may qualify the home for a “Bronze” designation when 3rd party inspections are performed. Flood Insurance discounts are also available due to the City’s participation in the Community Rating System. Can I clear vegetation or place fill on my vacant lot? Forestry mowing or hand clearing vegetation is allowed as long as jurisdictional wetlands are not impacted. Removal of protected trees with a 6 inch or greater diameter at chest height is prohibited without a tree removal permit. Fill placement on a vacant lot is prohibited unless a building permit has been issued or is actively in review at the Community Development Department. An accessory structure permit is required prior to constructing or placing a shed on your property. Please contact the Community Development Department for guidelines, (251)981-2610. How can I get a copy of an elevation certificate? For copies of Elevation Certificates, call the Community Development Department at 251-981-2610 or email the Floodplain Administrator, Landon Smith at lsmith@orangebeachal.gov. What are the minimum required setbacks for a new single-family dwelling? For single family residentially-zoned properties, the required front setback is 30 feet; the required rear setback is 20 feet; and the required side setbacks are 10 feet. Setbacks are applied from the property line. Can I park a recreational vehicle or motorcoach on a vacant lot? Occupied recreational vehicles are allowed only in recreational vehicle parks and designated areas of mobile home parks. Unoccupied recreational vehicles may be parked at an owner's residence or business but cannot be connected to water and sewer utilities. Recreational vehicles may be used by a homeowner while he/she is building a residence. The RV must be hooked up to water and sewer/septic tank, and the owner must have garbage service. The RV cannot be occupied longer than 6 months while the residence is under construction. Where can I find Zoning Map? Zoning Maps can be found by clicking the “Zoning ” tab where a PDF version of the City’s Zoning Map will be available for you to download or print in the About Section. Where can I find Floodplain Map? Floodplain Maps can be found by clicking the “Floodplain Maps” tab where a PDF version of the City’s Floodplain map will be available for you to download or print. Does Orange Beach have an interactive mapping website? How do I get to the Backcountry Trail? There are currently eight trailheads, the first and most well-know is the Catman Road trailhead located at 3801 Orange Beach Blvd. How can I make a reservation for a Backcountry Trail eco-tour? Backcountry Trail eco-tours are provided Tuesdays and Thursdays from January through March, weather permitting. Each tour can carry up to 7 people. The cost is $15 per person. Reservations are required and may be scheduled by calling the Community Development Department at (251) 981-2610. Where is the Disc Golf Park located? It is at 27920 Canal Rd, approximately 2 miles east of the intersection of Canal Rd and Hwy 161. It is adjacent to Unleashed Dog Park and on the way to Pleasure Island Tiki Bar at Sportsman Marina. When is the Disc Golf Park open? The hours are from Dawn to Dusk. Is there a fee for the Disc Golf Park? No, it is free and open to all. Is there an age requirement or a skill level? The 9 hole, Par 27 course is perfect for all ages and skill levels. Can I camp on Robinson Island? Overnight camping is prohibited by City Ordinance. Do I need to bring my own pooper scooper? We do ask that you curb your dogs. Bags are provided and we ask that you dispose in containers on site. The Unleashed In Orange Beach Dog Park is located at 27920 Canal Rd, approximately 2 miles east of the intersection of Canal Rd and Hwy 161, very close to Pleasure Island Tiki Bar and Sportsman Marina, adjacent to the Disc Golf Park. Unleashed is operated at no charge but does accept donations. I am worried about the safety of my small dog around large dogs. There are two separately fenced areas, one for small dogs and one for large dogs. There are water stations available inside both fenced areas. Can I drop a warrant? PFA can only be filed with the Baldwin County Circuit Clerk’s Office located in the courthouse in Bay Minette, AL. There is no charge to file a PFA. New laws went into effect as of July 2010 regarding who a PFA can be filed against. I was notified that there is a warrant for my arrest. What do I need to do to take care of this? In order to take care of an outstanding warrant, you must turn yourself into the Orange Beach Police Department. After the warrant has been executed, you will be given an opportunity to post a bond and you will be given a court date. You may contact the Orange Beach Municipal Court at 251-981-2444 to receive specific information pertaining to your case. What information do I need to obtain a warrant? To seek charges against someone you must first file a report with the Orange Beach Police Department. If probable cause exists, you will then be referred to the Municipal Court at 251-981-2444 to make an appointment for a probable cause hearing with a magistrate to determine if a warrant will be issued. You must have as much information as possible such as name, address, date of birth or age, employer and phone number. A warrant cannot be obtained without a police report. How can I take care of a ticket for no proof of insurance without having to go to court? If the vehicle listed on the ticket had insurance coverage at the time the citation was written and you did not have proof of it in the vehicle, you may bring proof of insurance to the Orange Beach Municipal Court before your court date. A magistrate will then determine if your ticket may be dismissed. If you obtained insurance coverage for the vehicle listed on the ticket after the citation was written, you may bring proof of insurance to Orange Beach Municipal Court. A magistrate will then determine if your ticket may be dismissed upon payment of cost. If the vehicle listed on the ticket did not have insurance coverage at the time the citation was written and you have not gotten insurance since, a court appearance is mandatory. Your court date is listed at the bottom of your ticket. Where is the Court Clerks office located? 4480 Orange Beach Blvd. Orange Beach, AL 36561. We are located at the Orange Beach Justice Center. If you did not pay your ticket on time or failed to appear to settle your case, the Alabama Law Enforcement Agency (ALEA) was notified and they suspended your license for failing to appear in court or non-payment. In order to have your license reinstated, you must first settle the charge(s) against you. Then contact the Alabama Law Enforcement Agency at your local Courhouse, where you obtain a driver's license, or you may call ALEA at 334-242-4400 for more information concerning the reinstatement fee. The Orange Beach Municipal Court is open Monday-Friday, 8:30 a.m.-5:00 p.m. The Court offices close at noon on the day of Court to prepare. How can I reinstate my driver's license? I am trying to reach the Baldwin County Satellite Court/District/Circuit Court/Sheriff’s Dept/License and Tag Dept/Probate Court/Marriage License. What is the process of obtaining a background check? If you were charged with a crime that was handled through the Orange Beach Municipal Court, you may obtain a copy of that record. Note that there may be a fee associated with this request. Otherwise, the Municipal Court CANNOT run a background check or a criminal history check. If you are in need of a background check for employment, housing rental, etc., you should call the Alabama Criminal Justice Information Center at 1-866-740-4762 for further instruction. Can someone else come and pay a ticket for me? How can I obtain a copy of a disposition of a case? You may call the Municipal Court at 251-981-2444. Note that there may be a fee associated with this request. How do I plead not guilty and request a trial date? To plead not guilty and request a trial date, you must appear in court on the date listed at the bottom of your ticket or on your appearance bond. How can I find out how much my ticket is? You may call the Municipal Court at 251-981-2444. If you have a case that requires a court appearance, the municipal judge will establish the fine amount in each case he presides over. Depending upon the change, the judge can place a fine of up to $500, plus costs. There are some offenses where the fine may be higher. Cash, cashiers check, money order, Visa or Mastercard debit or credit cards. A 4.5% processing fee will be charged if paying by debit or credit card. No personal checks or partial payments will be accepted. How do I plead guilty without going to court? In certain cases (i.e. minor traffic citations, etc.) the court will allow you to enter a plea before a magistrate and pay your fines and court cost. Full payment for all violations and late court fees must be made at time of plea. You may call 251-981-2444 for information on your case and if it can be handled out of Court. If your case requires a court appearance, you must appear in court on the date listed on your ticket or bond. You will appear before the Honorable Judge Brackin and enter a plea of guilty or not guilty to the charge. If you plead guilty, the judge will determine your fine based on the evidence against you and you will be required to pay the fine and costs in full at the time. If you plead not guilty, a trial will be held at that time. The Judge has the discretion to set a fine up to $500.00 and in some cases up to $5,000.00 plus cost. After I go to court, will the judge give me time to pay fines, court cost or restitution? Payments of fines, court costs and/or restitution are expected at the time you appear in court and you will be required to pay the fine and court costs at that time. If you need more time to pay, call the Municipal Court at 251-981-2444 and make your request. How do I know when to appear in court? The court date, time and location are listed near the bottom of your citation under the section labeled “Court Appearance Information," or it is noted on your Appearance Bond. Can I reschedule my court appearance? Call the Orange Beach Municipal Court at 251-981-2444 to reschedule your court date. Where do I register for youth sports when it is time, and what will I need? Who coaches the youth sport teams? What sports does the city offer, and to what age groups? Does the city offer baseball and softball? Does the city offer football? Typically, we run soccer registration during the month of August. The season will begin in September and run through October. Typically, we run basketball registration during the month of November. The season will begin in December and run through February. How will I know when sport registrations begin? “Like” City of Orange Beach Athletics on facebook to receive up-to-date information on all youth sports offered. Flyers are also sent home with the children at OBES just prior to the start of registration. Can I launch a jet ski from the beach? Beaching or launching personal watercraft from Gulf beaches is prohibited by City Ordinance. Are fireworks and/or bonfires allowed on the beach? Open flames of any kind are strictly prohibited by City Ordinance. Drinking alcohol is allowed on the beach but glass containers are strictly prohibited. For health and wildlife disturbance reasons, dogs are not allowed on Gulf Beaches. As an alternative, Unleashed in Orange Beach, our community dog park, or The Dog Pond at Lake Shelby in the Gulf State Park both offer you a great place to enjoy with your companion. Hit CTRL + Click to learn more http://www.orangebeachal.gov/facilities/unleashed-dog-park. Tents and sunshades are allowed north of the Mean High Tide Line as represented by posted signage. Only authorized government vehicles and beach maintenance vehicles are allowed on the beach. Fishing is allowed on the beach but chumming and/or shark fishing is prohibited. Is metal detecting allowed on the beach? Metal detecting is allowed on the beach but the City respectfully requests that holes be returned to natural grade following investigation. No, you will need to go to a Baldwin County Courthouse for drivers licenses, car tags and boat tags. Please call Baldwin County Courthouse, (the closest one is in Foley), 251-943-5061 or visit their website. Direct to http://baldwincountyal.gov/Government/probate. Renewals and tags/title can be handled in four Probate locations: Foley, Robertsdale, Fairhope and Bay Minette. A new drivers license requires a visit to one of the courthouses with a State Testing Officer present, as that is a state office offered in some of the courthouses as a courtesy from the state. They are Foley, Fairhope, and only the first Wednesday of the month, Bay Minette. You can obtain a State of Alabama fishing license at Wal-Mart in Orange Beach, 251-974-1810, other local tackle stores, online at https://www.outdooralabama.com/licenses/saltwater-recreational-licenses or over the phone at 888-848-6887. You can obtain a voter registration form from Orange Beach City Hall, however, the form will need to be mailed into the Baldwin County Registrars. To register to vote or make a change / correction to your voter record, Board Of Registrars - (251) 937-0305, 990-4614 and 972-6877. Yes, if your event will have an impact on traffic, will be held on public property, involves the sale of goods and services, involves the sale of alcohol or involves the sale of food. Visit our special events deparment for permitting and to learn more. Please call the Beach Express office, 251-968-3415 or visit their website, www.beachexpress.com. You can refer to our Trash and Recycling calendar to find out when your trash will be picked up. If your trash has not been picked up at the appropriate time, you can call the Finance Office's main number at 251-981-6096. Camp Sunshine is an After School Program, School Holiday Program and a Summer Camp. Camp Sunshine provides the perfect combination of recreational and educational activities for a well-balanced out-of-school experience. Children end each day excited about the broad range of engaging hands-on activities that allow them to develop their interests and skills, as well as having the opportunity to spend time on homework so that they can enjoy more quality time at home. Who can attend Camp Sunshine? Year round residents of Orange Beach, Alabama only may register their children. What age group of children can register? Camp Sunshine enrolls children who are in Kindergarten through 6th grades. Tuesday, Wednesday & Thursday, 9 am - 4 pm. Do I need a reservation to tour the Museum? Are group tours available at other times than normal hours? Yes - With advanced reservations group tours can be scheduled. Contact the Museum at 251-981-8545 for full details. reservations group tours can be scheduled. Contact the Museum at 251-981-8545 for full details. What type of artifacts will I find at the Museum? The Museum houses photos & memorabilia from the early days of Orange Beach. Focusing on the charter fishing industry, it contains many nautical pieces. In addition many Indian artifacts are on display that have been collected from the area. The library will gladly accept donations in good condition. We don't accept: encyclopedias, VHS, cassettes, damaged materials, extremely dated materials. Yes, as long as there is no patrons waiting on the item you can renew up to four items. Staff will also auto-renew materials as long as there is no one else waiting for the item. Do you have a business center (printing, copies, faxing, scanning)? Yes, we have a full service business center available. Black and white prints and copies are 15¢, Color prints and copies are 50¢, Faxing: $2.00/first page, and $1.00 per page for each subsequent page and $1.00/page to receive, Scanning: $1.00 for up to 6 items scanned. I'm from out of town...can I get a library card? Does it cost anything? Visitors are welcome! Anyone can get a library card! You'll just need a valid form of picture ID. (Patrons under 13 must have parent/guardian sign the application). Your PIN Number is the last four digits of your library card. Yes, we have a 15 computer terminals with free internet access and a variety of software available. There is no fee to use the computers, however, we ask that you limit use to 30 minutes when others are waiting for computer access. Are visitors able to use the Recreation Complex? Yes. Non –Member day passes are available for $5 per person per day. Also includes access to Aquatics Center & Tennis Center. Yes. There are changing rooms and showers available during our normal hours of operation. Towels and toiletries are not provided. Do we have an indoor pool? No. We do have an outdoor Junior Olympic size pool which is heated during the colder months and open year round. Yes. List of personal trainers is available at Recreation Center. What are Rec. Center hours? Just off of Canal Road at 4849 Wilson Blvd. If coming from Gulf Shores on Canal Rd.., when you get to the light at the intersection of Canal and Highway 161, continue east on Canal 1.3 miles on the left just across from Fire Station 2. What is included in the day pass? The day pass includes the Recreation Center workout room, game room, inside basketball Court, outdoor heated pool, tennis courts. Do you offer fitness classes and what is the cost? Yes. $5 per class or 15 class punch card for $50. We have an Unlimited class pass (Recreation Center only) with a paid current membership $150 per person per year. No. We accept cash or checks. We are coming down for a baseball/softball tournament at your facility, can we get some more information on scheduling, admission fees, etc.? The Orange Beach Sportsplex rents out its fields to different organizations, and that organization controls gate fees, scheduling, and any other tournament related issues. The sportsplex only controls the use of the facility. Is there a gym or pool located at the sportsplex? No; the sportsplex consists of nine baseball/softball fields, two soccer fields, and one multipurpose field. The sportsplex does not have any indoor athletic facility. The city’s gym and pool are located at the OB Rec Center and the OB Aquatics Center. Can we park our RV or camper at the sportsplex overnight? No; the sportsplex does not allow any RV or camper to stay overnight. There are several campgrounds and RV parks in the area we encourage you to check out. How much does it costs for my organization/team to rent out the fields? The time of year your organization will be using the fields. The city in which your organizations/teams will be staying while they are here. The amount of time/days your organizations to use the fields. Where is the OB Sportsplex located? The sportsplex is located at 4389 William Silvers Parkway in Orange Beach, AL (off of Canal Road). Can you string my racket? Yes, we have a string machine on site. Come on by the Pro Shop and let us take a look and give you a price. Do you carry tennis shoes, rackets, grips, balls, other merchandise? Yes, we have a full service Pro Shop stocked with tennis equipment, apparel and more. $2.00 per person unless you have a membership at the Rec Center. How much are tennis lessons, clinics, cardio tennis, etc.? When do you hold tennis tournaments and socials? Please check the USTA website for junior tournaments and the Tennis Center calendar for upcoming events and socials.